Six years ago, my best friend Josh and I were single college grads with dreams of traveling each summer to a different remote locale in pursuit of world class game and fish. The objective was to do it all before we had families and responsibilities that we assumed would keep us at home; catch monster walleye and pike in Quebec or Ontario, kill giant black bear with our bows in Manitoba, fly fish the Snake River in Colorado for world class trout, hunt giant whitetails in Southern Illinois, and maybe even take a trip to Africa to hunt Africa’s plethora of dangerous big game. Those dreams still exist today because we didn’t make it much further than Lake Ogascanan in the remote rugged wilderness of Quebec, CA. 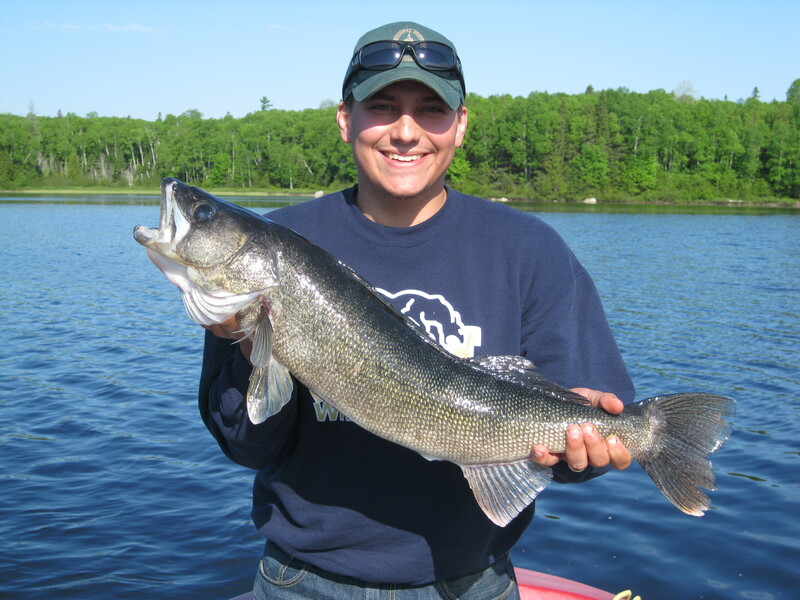 If you are serious about fishing, willing to fish more than you drink beer, and looking for a quality walleye, pike, and lake trout adventure, then Lake Ogascanan Lodge is the place for you. Ogascanan is part of the Kipawa Lake series and is located roughly 310 miles north northeast of Toronto. If you have a four wheel drive vehicle and follow the directions given to you, then you will have no problem finding the lodge. We have traveled to Ogascanan several times in the last few years and like any Canadian fishing expedition catching fish isn’t guaranteed. The Mullens family, the outfitters of Lake Ogascanan Lodge, will be the first to tell you that. Each year we catch more and bigger fish than the years before. I am not sure whether that is a result of comfort and familiarity with the lake or experience but I suspect our success has been driven by a little bit of both. We have never had a bad experience at Lake Ogascanan but we use multiple techniques and fish as many hours as we can throughout the week. We have tried many types of bait over the years. Spinners, spoons, rubber imitations, twisters, jig heads, and jig head variations. All have worked well enough with limited success, but nothing kept pace with the road runner worm chunk or leach combo. I even keep a paint chipped reminder at my desk of the road runner’s effectiveness. Threading approximately 1/3 of a night crawler on the hook of a road runner gives you a walleye bait with extreme durability and natural presentation that can be fished effectively many different ways. We caught walleye, pike, and lake trout trolling, drifting dead, jigging, and drift jigging all with chartreuse, white, and red road runners threaded with a piece of night crawler. We caught fish from 4-34 feet of water throughout the week fishing points, structure, muddy shorelines, weed beds and channels. Later in the week we slammed fish in the minutes before and after dusk in 5-10 feet of water. As I said before, Josh and I had dreamed of catching a monster Canadian walleye on light tackle, without a guide for years, and although we have caught our fair share of numbers we were yet to tango with a giant. This summer we had an encounter that I will never forget as I hooked and landed this 32inch 10.5lbs monster walleye early in the week in Ferguson Bay. We decided to venture south to Ferguson Bay after putting the other members of our group on fish in the Northern parts of the lake. The trip to Ferguson was exploratory in nature and our expectations had been lowered as we were merely hoping to find some fish to aggressively target in the evening. We were pulling a morning drift searching for a pocket of fish and I was slow jigging with a chartreuse road runner even though the wind had us drifting at a decent rate of speed when suddenly a tension began to build on my line as if it had caught on a log and snagged on the bottom. I set the hook instantly and recognized the weight of a giant hugging the bottom of the bay. The fish fought tenaciously and made sure I felt the full effect of its weight and power. At first, Josh and I thought it was a lake trout but several minutes later after a few trips around the boat the fish relinquished its death grip position from the bottom and it brought the fight to suspended water where we saw it was the type of walleye we had dreamed about. After a few short and powerful runs I positioned the monster eye on the surface near the boat and with one swift plunge of the net Josh had successfully netted and dropped it in the boat. Pure elation followed. Multiple double high fives and cheers of joy, pats on the back, smiles and pictures went on for what seemed like the remainder of the morning. We were pumped! Estimated at 19-20 years in age this fish truly was the trophy I had been chasing for years. I was lucky enough to be able to share in the experience with my best friend, El Capitano himself, Josh Keebler, who has remained committed to our fishing trips as much as I have and traditionally catches more eyes on our annual trip than anyone else. As a group we caught 586 fish, roughly 485-500 walleye, the rest being pike, lake trout, with a few snubbed nosed trout and whitefish speckled throughout. We released nearly everything; 460-475 walleye were released as we only kept 25 walleye for eating during the week. We also released every pike, laker, snubbed nose, and whitefish. The second highest fish total for any other group on the lake was 102. To give you some perspective, Josh caught 120+ by himself. The Team Surra Outdoors crew dominated Lake Ogascanan the week of June 5th- 12th from the Northern Outpost. The trip to Lake Ogascanan Lodge was more than just a fishing trip. It was an escape to the outdoors with family and friends were we caught our targeted species (walleye), witnessed giant 40+ inch pike attack pike and walleye already on our lines, viewed a bald eagle snatching fish out of the water 15 feet from our boat, and spent our evenings drinking beer and sharing in stories filled with laughter from the day’s events. Big thanks to all who represented Team Surra at Lake Ogascanan: Andy Surra, Josh Keebler, Ricky Luchini, Jimmy Duttry, Paul Bussard, Dan Surra, Dom Surra, and Doug Surra. Some of the pictures from our trip can be found at the Fresh Fish page on the Lake Ogascanan Lodge website. If you are interested in fishing Lake Ogascanan Lodge contact Brad, Ginny, Dan & Jeremy Mullens, 47 Sunset Blvd. North Bay, Ontario P1A 1R4 CANADA, or call toll free 866-476-6036. I recommend emailing Ginny Mullens at ogas@vianet.ca. I promise you will not find a better group of outfitters. Their hospitality, honesty, and accommodations are unparalleled. Tell them Team Surra sent you. If you schedule a trip to Ogascanan and would like some information on anything from fishing hotspots and tackle to cabin locations and recommendations email us your questions at teamsurra@gmail.com. ← Okay, I’ve seen the place. Now where to I hang my treestand …? You sure didnt catch that on a Trout Worm! Ha. Very nice fish…..
Video is awesome. Great camera work. Nice job keeping the language family friendly through the adrenaline. I bellieve it was on a Roadrunner and a worm..
One other thing. One of the best things about fishing Lake Ogascanan is the evening sunsets. We fished late alot of the time, and the sunsets there are more beautiful than any sunset I have ever seen.